BACKGROUND AND AIM: Prenatal mental health has been shown to be related with postpartum depression. However, the role of mental and psychological factors in postpartum depression requires especial attention. Furthermore, the relationship between demographic factors and postpartum depression is contradictory. The study was aimed to identify role of prenatal anxiety and depression and demographic factors with postpartum depression. MATERIALS AND METHODS: A prospective cohort study was conducted with 303 pregnant women who have gestational age from 28 to 36 weeks and referred to health-care centers in Isfahan city and follow-up for 6–12 weeks after postpartum. Data were collected using the demographic form, Edinburgh depression, and anxiety Spielberger questionnaire during pregnancy and Edinburgh depression inventory in the 6th and 12th weeks after childbirth. Descriptive statistics and linear logistic regression were used to analyze the data. In demographic factors, data were analyzed using the Student's t-test, Chi-square, Pearson and Spearman test and after the meaningfulness of regression was used. RESULTS: Results showed that the 6 and 12 weeks after childbirth, 61 patients (20/1%) and 33 patients (10/9%) had postpartum depression. The most important risk factors for depression in the first 6 weeks were history of infertility (confidence interval [CI]: 0.56–0.767) (P = 0.018) and history of depression (CI: 1.155–1.369) (P = 0.000) and in 12 weeks, postpartum were history of depression (CI: 0.072–1.305) (P = 0.001). CONCLUSION: Infertility and history of depression during pregnancy were two risk factors of postpartum depression which should be taken into consideration during prenatal care. Postpartum depression is the most common psychological disorder in the 1st year after childbirth. It is characterized by mood swings, appetite changes, excessive sadness, death thoughts and suicide,, reduction of the quality of life, difficulties in mother and infant's attachment, and reduction on the cognitive aspects of the child. The role of biological agents and hormonal fluctuations on this disorder has already been described. However, variations in the prevalence of this disorder justify the role of social factors or other factors on this disease. In Iran, high prevalence has been reported. In a systematic review by Veisani et al. (2012), this prevalence was reported as 28.7%. The prevalence of disease in different societies was about 8.4%–39%. Women with having risk factors such as low social support level develop this disorder,, and previous history of mental illness is the predictive factor of postpartum depression,, but these relationships are complex., Moreover, it is not clear why some women are at the greater risk of depression and anxiety., In other studies, no relationship has been found between pregnancy severity of anxiety and depression 6 weeks after postpartum. Contradictory relationship between depression during pregnancy and postpartum depression has been reported., Studies have focused on the significance of psychosocial factors' screening during pregnancy and even in the first prenatal visit. In general, despite the importance of postpartum depression and negative effects on maternal and neonatal health, there are ambiguities in the relationship between depression and perinatal anxiety with postpartum depression and the recognition of different angles of this disorder and risk factors during pregnancy is required. The purpose of this study was to determine the relationship between anxiety and depression and demographic factors during pregnancy with postpartum depression. The current research was a prospective cohort study which was done after approval by the Ethics Committee, Isfahan University of Medical Sciences, from August 2016 to April 2017. The target population was pregnant women undergoing prenatal care at Isfahan health-care centers. Inclusion criteria were the gestational age of 28–36 weeks, lack of medical problem, and having a single pregnancy. Exclusion criteria included lack of specific psychological stress experienced as the loss of a beloved relative and unwillingness to continue to participate in the study at any time from the research process. Samples were selected randomly from the first and second networks of Isfahan by convenient sampling method, among pregnant women who referred to health centers daily. In this way, all the health-care centers were divided into two clusters, and among these clusters, six centers of each network were randomly selected in a draw. The researcher selected sampling based on the criteria for inclusion criteria, gave them an informed consent form to sign. Participants were assured that the data would remain confidential. The questionnaires were completed by the participants themselves after a complete description. With assuming the prevalence of postpartum depression as 27% and estimation of the confidence interval 95%, 303 pregnant women with a gestational age of 28–36 weeks were chosen. All participants were followed up for 6 and 12 weeks without loss. The research instrument includes three questionnaires. During 28–36 weeks of gestational age, demographic form, the Edinburgh depression questionnaire, and the Spielberger anxiety questionnaire were used for data collection. Subsequently, 6 and 12 weeks after childbirth, Edinburgh depression questionnaires were used for data collection. The Edinburgh Depression Inventory was designed in 1987 by Cox et al. This questionnaire had 10 questions with four options from zero to three in terms of the severity of symptoms. Questions 1, 2, and 4 were scored from 0 to 3 and questions 3, 5, 6, 7, 8, 9, and 10 were scored from 3 to 0. Maximum and minimum scores were 30 and 0, respectively. Previous studies reported the cutoff point above 12 as postpartum depression. The Cronbach's alpha coefficient for the Edinburgh questionnaire in Iran was reported as higher than 0.80. It has been reported. The study in Isfahan reported the Cronbach's alpha coefficients of the Edinburgh questionnaire as 0.76–0.79. Validity of the questionnaire was reported as 0.79 with the sensitivity of 78%, sensitivity of 75%, and the cutoff point of 12. The Spielberger anxiety questionnaire measures anxiety (state) and anxiety (trait). This questionnaire contained 40 questions with questions 1–20 and 21–40 for the measurement of situational and state anxiety, respectively. Some questions that indicated no anxiety had reverse scoring method. Using the four-option scale, the range of scores was from 20 to 80. A score 20–29 indicated relatively mild anxiety, a score 30–49 indicated relatively severe anxiety, a score 50–69 indicated severe anxiety, and a score 70–80 showed severe anxiety. This questionnaire was standardized in Iran in 1993 with the Cronbach's alpha coefficient of 0.78. Descriptive (frequency distribution) and inferential statistics (liner regression analysis) and correlation were used for data analysis. Moreover, in demographic factors, the mean differences within group 6 and 12 weeks postpartum were analyzed using the analysis of variance (ANOVA), Student's t-test, and Mann–Whitney U-test. Chi-square analysis was used to examine the relationship between the dichotomous demographic/psychosocial variables and nominal variable. One-way ANOVA tests examined the relationship between the continuous demographic/psychosocial variables. The correlation between the main and underlying variables was analyzed by Pearson and Spearman test. For prediction, after the meaningfulness of regression was used. P < 0.05 was regarded as statistically significant. Data analysis was used through the SPSS software version 19(IBM Company, Armonk, NY, USA). The mean age of participants was 29/33 years and mean gestational age 32/65. 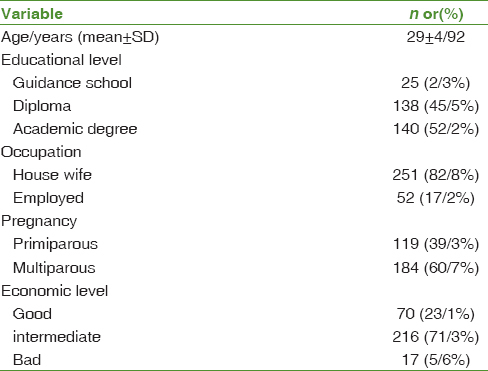 The majority of the participants in this study had university education (52/2%), economic status medium(71/3%), multiparous (60/7%), and housewife (82/8%)[Table 1]. It was found that 6 and 12 weeks after childbirth, 61 (20/1%) and 33 (10/9%) had postpartum depression, respectively. Furthermore, the results of multiple regression showed that the most important predictor of depression during the first 6 weeks after childbirth was the history of infertility and depression during pregnancy and the most important predictor of depression 12 weeks after childbirth was the history of depression during pregnancy. No statistically significant relationships were reported between job, education level, residence, economic status, number of pregnancies, abortion, gestational age, situation, and state anxiety and depression 6 and 12 weeks after childbirth [Table 2]. The most important predictive variables of postpartum depression are shown in [Table 3]. The results of the current study showed that there is a relationship between depression during pregnancy and some of demographic factors with postpartum depression. Based on the findings, the most important predictor of postpartum depression was the history of depression during pregnancy and history of infertility. In the present study, no relationship was reported between anxiety and postpartum depression. Similar to the results of this study, in some prospective studies, no relationship was seen between the dimensions of anxiety and postpartum depression. However, in other studies, there has been an association between anxiety and postpartum depression., In the present study, the previous history of depression was the most important predictor of postpartum depression. The results of other studies also emphasized that the previous history of depression was a risk factor of postpartum depression. According to several studies, the most potent risk factor of posttraumatic depression was the previous history of anxiety, mood disorders, and untreated depression, especially during pregnancy., It is evident that women with the history of depression were more sensitive to hormonal changes. Women with a history of depression already had 20 times more risk of postpartum depression. Furthermore, in the psychosocial risk assessment model, psychological responses have been reported as risk factors for postpartum depression. In the current study, demographic factors and postpartum depression had no relationships except for infertility. Some other studies also have no relation between personal and social variables and postpartum depression except marital relationships. Furthermore, in a study by Ross et al., it was found that social variables were not strong predictors of postpartum depression. The results of a study showed that no relationships were found between the income, education level, and postpartum depression. In the present study, a relationship was found between infertility and postpartum depression. Similarly, a study in Turkey showed that infertility was not an important risk factor, but the risk of postpartum depression was 1352 higher than healthy women. Unlike the above results, the results of a systematic review revealed that no relationship was found between infertility, fertility treatment, and postpartum depression. Perhaps, the reason for relation between infertility with depression is that's infertile women suffer more stress than others and that they need counseling because of extreme stress. And that event stressful is source for postpartum depression. Despite the high prevalence of postpartum depression and that there is a strong correlation between the previous history of depression and the risk of postpartum depression in our study, about 90% of women who experience depression episodes had not received any psychiatric care and are exposed to the complications of the disease; this should be taken into consideration in perinatal care. Risk factors such as the history of depression during pregnancy or the history of infertility can be important predictors of postpartum depression. Given the presence of these risk factors and the timely referral of these women with high screening scores, the prevention of postpartum depression is improved. This study is part of a research thesis proposal approved by the Isfahan University of Medical Sciences, which was performed with financial support of the Research Council of the University. This study was supported by Isfahan University of Medical Sciences (Grant Number: 394313). Gibson J, McKenzie-McHarg K, Shakespeare J, Price J, Gray R. A systematic review of studies validating the Edinburgh postnatal depression scale in antepartum and postpartum women. Acta Psychiatr Scand 2009;119:350-64. Aswathi A, Rajendiren S, Nimesh A, Philip RR, Kattimani S, Jayalakshmi D, et al. High serum testosterone levels during postpartum period are associated with postpartum depression. Asian J Psychiatr 2015;17:85-8. Norhayati MN, Hazlina NH, Asrenee AR, Emilin WM. Magnitude and risk factors for postpartum symptoms: A literature review. J Affect Disord 2015;175:34-52. Da Costa D, Dritsa M, Rippen N, Lowensteyn I, Khalifé S. Health-related quality of life in postpartum depressed women. Arch Womens Ment Health 2006;9:95-102. Josefsson A, Larsson C, Sydsjö G, Nylander PO. Temperament and character in women with postpartum depression. Arch Womens Ment Health 2007;10:3-7.
Cooper P, Murray L. Prediction, detection, and treatment of postnatal depression. Arch Dis Child 1997;77:97-9. Osborne LM, Gispen F, Sanyal A, Yenokyan G, Meilman S, Payne JL, et al. Lower allopregnanolone during pregnancy predicts postpartum depression: An exploratory study. Psychoneuroendocrinology 2017;79:116-21. Goker A, Yanikkerem E, Demet MM, Dikayak S, Yildirim Y, Koyuncu FM, et al. Postpartum depression: Is mode of delivery a risk factor? ISRN Obstet Gynecol 2012;2012:616759. Robertson E, Grace S, Wallington T, Stewart DE. Antenatal risk factors for postpartum depression: A synthesis of recent literature. Gen Hosp Psychiatry 2004;26:289-95. Gunduz S, Kosger H, Aldemir S, Akcal B, Tevrizci H, Hizli D, et al. Sleep deprivation in the last trimester of pregnancy and inadequate Vitamin D: Is there a relationship? J Chin Med Assoc 2016;79:34-8. Kheirabadi GR, Maracy MR, Barekatain M, Salehi M, Sadri GH, Kelishadi M, et al. Risk factors of postpartum depression in rural areas of Isfahan Province, Iran. Arch Iran Med 2009;12:461-7. Biaggi A, Conroy S, Pawlby S, Pariante CM. Identifying the women at risk of antenatal anxiety and depression: A systematic review. J Affect Disord 2016;191:62-77. Alipour Z, Lamyian M, Hajizadeh E. Anxiety and fear of childbirth as predictors of postnatal depression in nulliparous women. Women Birth 2012;25:e37-43. Abedian Z, Soltani N, Mokhber N, Esmaily H. Depression and anxiety in pregnancy and postpartum in women with mild and severe preeclampsia. Iran J Nurs Midwifery Res 2015;20:454-9. Kheirabadi GR, Maracy MR. Perinatal depression in a cohort study on Iranian women. J Res Med Sci 2010;15:41-9. Park JH, Karmaus W, Zhang H. Prevalence of and risk factors for depressive symptoms in Korean women throughout pregnancy and in postpartum period. Asian Nurs Res (Korean Soc Nurs Sci) 2015;9:219-25. Carroll JC, Reid AJ, Biringer A, Midmer D, Glazier RH, Wilson L, et al. Effectiveness of the antenatal psychosocial health assessment (ALPHA) form in detecting psychosocial concerns: A randomized controlled trial. CMAJ 2005;173:253-9. Deng AW, Xiong RB, Jiang TT, Luo YP, Chen WZ. Prevalence and risk factors of postpartum depression in a population-based sample of women in Tangxia community, Guangzhou. Asian Pac J Trop Med 2014;7:244-9. Kheirabadi GR, Maracy MR, Akbaripour S, Masaeli N. Psychometric properties and diagnostic accuracy of the Edinburgh postnatal depression scale in a sample of Iranian women. Iran J Med Sci 2012;37:32-8. Sharifi F, Nouraei S, Shahverdi E. The relation of pre and postnatal depression and anxiety with exclusive breastfeeding. Electron Physician 2016;8:3234-9. Kumar R, Robson KM. A prospective study of emotional disorders in childbearing women. Br J Psychiatry 1984;144:35-47. Austin MP, Tully L, Parker G. Examining the relationship between antenatal anxiety and postnatal depression. J Affect Disord 2007;101:169-74. Dennis CL, Brown HK, Falah-Hassani K, Marini FC, Vigod SN. Identifying women at risk for sustained postpartum anxiety. J Affect Disord 2017;213:131-7. Silverman ME, Reichenberg A, Savitz DA, Cnattingius S, Lichtenstein P, Hultman CM, et al. The risk factors for postpartum depression: A population-based study. Depress Anxiety 2017;34:178-87. Stewart DE, Vigod S. Postpartum depression. N Engl J Med 2016;375:2177-86. Wisner KL, Sit DK, McShea MC, Rizzo DM, Zoretich RA, Hughes CL, et al. Onset timing, thoughts of self-harm, and diagnoses in postpartum women with screen-positive depression findings. JAMA Psychiatry 2013;70:490-8. Bloch M, Daly RC, Rubinow DR. Endocrine factors in the etiology of postpartum depression. Compr Psychiatry 2003;44:234-46. Priest SR, Austin MP, Barnett BB, Buist A. A psychosocial risk assessment model (PRAM) for use with pregnant and postpartum women in primary care settings. Arch Womens Ment Health 2008;11:307-17. Małus A, Szyluk J, Galińska-Skok B, Konarzewska B. Incidence of postpartum depression and couple relationship quality. Psychiatr Pol 2016;50:1135-46. Ross LE, Campbell VL, Dennis CL, Blackmore ER. Demographic characteristics of participants in studies of risk factors, prevention, and treatment of postpartum depression. Can J Psychiatry 2006;51:704-10. Miyake Y, Tanaka K, Sasaki S, Hirota Y. Employment, income, and education and risk of postpartum depression: The Osaka maternal and child health study. J Affect Disord 2011;130:133-7. Akyuz A, Seven M, Devran A, Demiralp M. Infertility history: Is it a risk factor for postpartum depression in Turkish women? J Perinat Neonatal Nurs 2010;24:137-45. Ross LE, McQueen K, Vigod S, Dennis CL. Risk for postpartum depression associated with assisted reproductive technologies and multiple births: A systematic review. Hum Reprod Update 2011;17:96-106. Pereira PK, Lovisi GM, Pilowsky DL, Lima LA, Legay LF. Depression during pregnancy: Prevalence and risk factors among women attending a public health clinic in Rio de Janeiro, Brazil. Cad Saude Publica 2009;25:2725-36.